When the Australian Self-Publisher newsletter was launched in November 2017, we put together a reader survey to obtain a snapshot of our audience and to ask for feedback on the content that the Australian self-publishing audience would want to know more about. The survey closed on 31 December 2017 and had 199 anonymous responses. The majority of the respondents were either authors or self-publishers, with 41.1% of respondents identifying as authors and 37.5% as self-publishers. Small publishers that produce fewer than 20 titles per year accounted for six percent, while about one percent of respondents identified as a medium-sized publisher (with fewer than 100 titles per year). Publishing service providers (book designer, publicist, editor, etc.) accounted for around two percent of respondents. Interestingly, 11.6% of respondents ticked ‘other’ and further qualified themselves in the comment field as ‘hybrid authors’, ‘self-published authors’, ‘indie publishers’ or other combinations of the categories provided in the survey. Nearly 89% of respondents said they would like to read more local (Australian) self-publishing news, and nearly 91% of respondents want to learn more about the products and services available to help them publish. 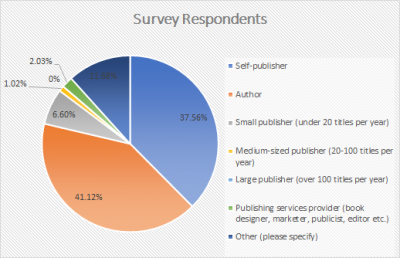 About 81% would find it useful to hear about other self-publishers and their journeys. More than half (60.9%) the respondents would find it valuable to learn about professional development opportunities. 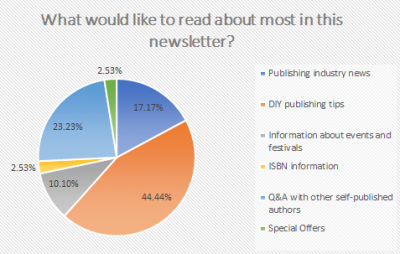 In response to the question, ‘What would you most like to read about in this newsletter?’, 44.4% of respondents selected ‘do-it-yourself (DIY) publishing tips’, 23.2% of respondents chose ‘Q&A with other self-published authors’ and 17.1% said they wanted ‘publishing industry news’. Information on events and festivals was also of interest to 10.1% of respondents, while special offers and ISBN information both drew 2.5% of the vote. The survey also provided readers the opportunity to voice their comments or feedback. The overall feedback showed just how many authors/publishers/indies there are out there who are taking on self-publishing with an entrepreneurial spirit and business-minded professionalism. New technology and services abound for those who need a helping hand, yet there is definitely a confidence gap in some areas. Many comments referenced the confusion or difficulty faced by self-publishers around distribution and getting books into bookstores. Requests were also made for more information on: print-on-demand, small cost-effective print runs, printers in general, marketing and promotion, finding readers and reputable editors, how to go about book launches, and copyright. 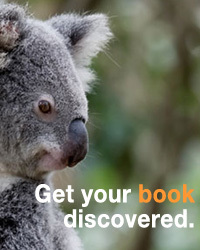 Australian Self-Publisher recognises the need for more reliable, local sources of information, and will endeavor to close gaps in knowledge and address the issues facing independent publishers and self-publishers.